Here you are going to find the best emergency dentists in O’Fallon MO. Emergency Dentists USA is a resource to help you find a 24 hour urgent care dentist near you. We provide an emergency dental referral hotline that you can call and speak to an operator who will help you get in touch with after hours dentists near you in seconds. This referral service is 100% free to use and is open 24/7, so if you’re suffering from a dental emergency, call today! Also, further down the page we provide a directory listing of certain emergency dentists in O’Fallon, Missouri, this can help you find an urgent care dentist as well. After searching through our list, if you are not able to reach a dental professional, please utilize the O’Fallon emergency telephone number we provide you with to get prearranged appointments with urgent care dentists in O’Fallon. 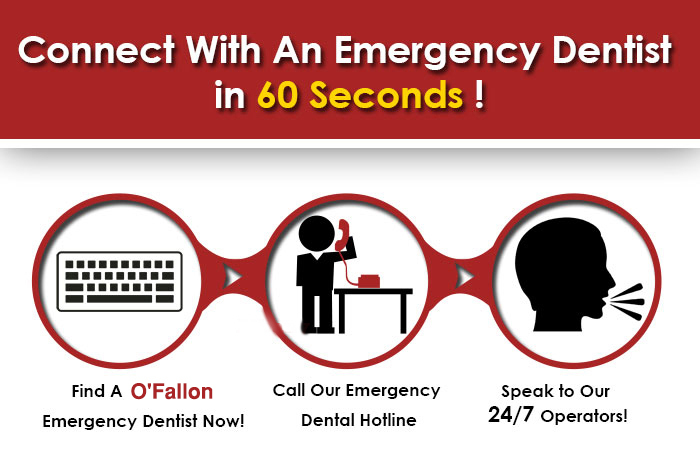 Twenty-four hours a day, Seven days a week you’ll be able to reach the operators at our emergency dental telephone, simply call today and then get placed in connection with a O’Fallon emergency dental clinic. This is a suburb of St. Louis situated right along the I70 corridor, and is the 7th largest city in the state of Missouri. In 2006, Money Magazine named O’fallon 39th in its “Top 100 places to live” list. During the 1800s, this city had major growth due to the coming of the railroad, just as many others have through the years. This is the home of Mastercard’s Global Technology and Operations Center, where many thousands of credit card transactions are settled electronically. The O’Fallon Sports Park is a 95 acre soccer complex with 12 fields and playgrounds, and is a prime spot for residents to get fresh air and activity for them and their children. Westhoff Park is another great recreation area in which extreme sports enthusiasts will love the skatepark, sand volleyball courts, horseshoe pits, basketball, and handball courts. Some of the city’s top employers are Lamasoft, Ungerbeck Software International, Crown Castle, Celerity, and Advanced Resources. We receive tips and comments from many of our clients who call in about how to handle different dental emergencies. One of those types of situations is a sudden and severe toothache. If you’re suffering from a toothache that hurts a lot and is getting in the way of everyday activities, we suggest you wash the affected area with warm water to cleanse it, and use an ice pack to put pressure on the area from outside your mouth. Also gently use dental floss to check around the tooth to see if anything is lodged next to it that may be creating the pain. Then get an appointment with an emergency dentist in O’Fallon Missouri as soon as possible. These dental entries listed here are recommended by E-Dentists USA and all of these emergency dentists possess some type of after hours sessions or night time and weekend care, although not all of them will be Twenty four hours. This unique database is perfect for anyone to help find an emergency dental office near you, however if you want to bypass the extra work associated with calling each and every dentist, utilize the 24 hour phone line we offer and be connected to an urgent care dentist in seconds. Emergency Dentists USA supplies a solution for that which once was a challenging, time-consuming matter. We have taken the time to complete the researching on your behalf through going over the emergency dentists in O’Fallon and pulling out the ones we notice to make available after hours, weekend or evening treatment. A niche market has evolved supplying dental health treatment solutions to individuals in need of assistance. Description This is our referral service phone number, please call today to get ahold of an emergency dentist in O’Fallon, this is the fastest and simplest method to reach a dentist and it takes the problem out of your hands because the operators do the work for you! where they stand, and when they need to come visit again. detail whitening for just $327. community, and they were all very happy to offer care to many on Free Dentistry Day last November. of all the professionals here. You should always check out just about any dental professional you’ve never ever been to before by looking these folks up with this Missouri Dental Association Page. Check out additional cities in Missouri.